We are now posting PWTorch Digital Newsletters for the year 2001 for the first time ever. These issues in 2001 were previously available online in text-article format or paper copy editions sent to subscribers originally the week they were published. We plan to publish all of 2001's PWTorch Newsletters in digital format throughout 2011 at the rate of about one per week. 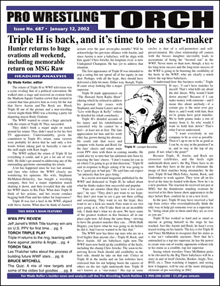 This issue begins with a cover story on Triple H's return to the WWF and why it's time for him to be a star-maker... In-depth coverage of the WWA PPV with the match report with star ratings, roundtable reviews, and reader reax, plus Wade Keller's End Notes looks at WWA... Part two of Jason Powell's 2001 Year in Quotes... Part two of the Torch Talk with Les Thatcher talking about the WWF training system... Plus Live Event Reports on two WWF house shows, 1992 Backtrack on the Ding Dongs, Raw Report, WWF results, and Indy Results. NOT VIP YET? CLICK HERE: CLICK HERE FOR SIGN-UP INFO. APP USERS: Log onto http://www.pwtorch.com/govip for sign-up info.